Maria Montessori was born in 1870, a time when education, university, medicine, and pedagogy seemed to be exclusively for men. But Maria decided to study medicine and nobody could stop her. 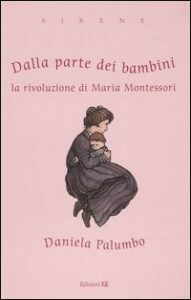 Once she had become a scientist, she chose to dedicate herself to children, and founded the Case dei bambini (Children’s Houses) in the poorest neighbourhoods of Rome: the famous Montessori method was thus created. The method is based on the right of children to be loved and respected, and to express themselves freely. Narrated in the first person by Daniela Palumbo and finely illustrated by Vanna Vinci, this beautiful biography of Maria Montessori simply, accurately, and yet excitingly, tells the life of an extraordinary woman. The protagonist rebels against conventions, radically changing pedagogy of her time. Unfortunately, Maria Montessori pays a high price for her determination and courage to challenge gender roles. However, she eventually manages to reconcile professional and personal life. The book does not hide the difficulties she encountered, and succeeds in creating a powerful and attractive round portrait of Maria Montessori. The series “Sirene” published by Einaudi was conceived to presents the biographies of women who have challenged and overcome gender stereotypes with their choices.